We believe GroupLife is a vital component to living that abundant life in Christ. When we live our mission of helping people become deeply devoted followers of Jesus Christ, we are committing to a journey, a path, an adventure called Christian discipleship. Discipleship is not something done alone. We are meant to be in relationship, in community, with one another to encourage growth and unity, and to reflect Christ’s nature to the world. At HPUMC, we call these Christian communities GroupLife. GroupLife takes on different structures and styles to accommodate different needs and busy lives. Nothing will bring greater joy, challenge, or meaning to your life than to live abundantly as God intended. Regardless of where you are in your Christian journey, we provide opportunities that encourage integrating faith and life. We invite you to grow in Christ by connecting with GroupLife. 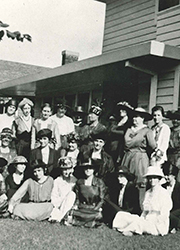 The first women’s fellowship group was the Women’s Missionary Society (predecessor to United Methodist Women). They begin meeting in Dallas Hall to discuss how to get young people involved and increase membership. Sunday school classes for men and women, and young women were formed almost immediately after the formation of Highland Park MECS.